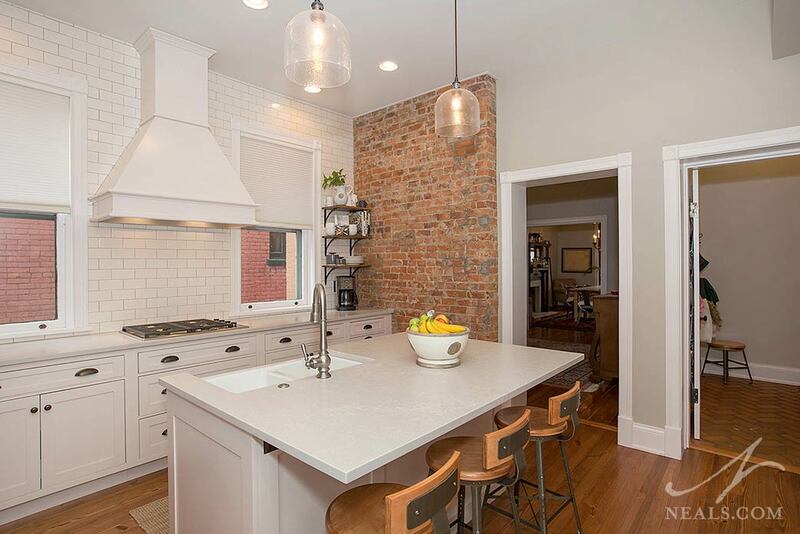 Going into the kitchen remodel of this classic row house in Newport, already more than 100 years old, it was clear that the entire space would be completely reworked, and the back of the home’s brick fireplace would be exposed. 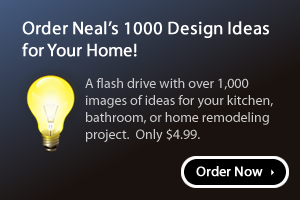 Using that as a springboard for the remodel, the small kitchen was redesigned with the type of charm and timelessness suitable to the home’s pedigree. 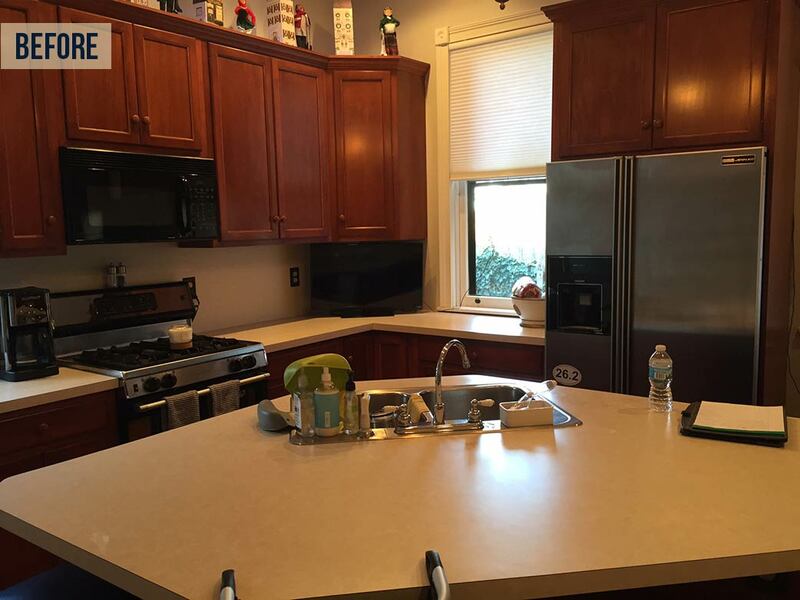 The existing kitchen had been remodeled at some point into a generic space with brown cabinets, beige countertops, and very little unique character. The center of the kitchen was taken up by an over-sized, irregularly shaped island, and the dark cabinetry seemed to overpower the natural light from the three windows. To carry the new look- which can be described as a fresh take on an Arts & Crafts style kitchen design- the Brookhaven Kingston recessed panel cabinets are painted a warm white, and have a beaded inset door style, which is a very subtle but a key choice that makes the new kitchen feel older and more correct for the home. A feature wall of the new kitchen is the airy window wall. 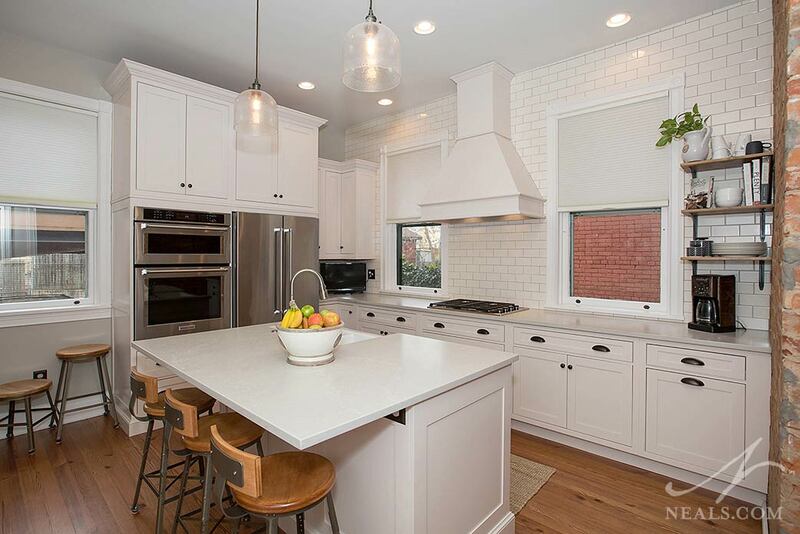 Rather than load the wall up with tall cabinets, classic white subway tile covers the wall. This choice allows the windows and wooden vent hood create an interesting focal open while keeping the kitchen light and open. Just a gas cooktop is installed here, leaving the rest of the counter free and ready for work. The island is an important element of the new kitchen. 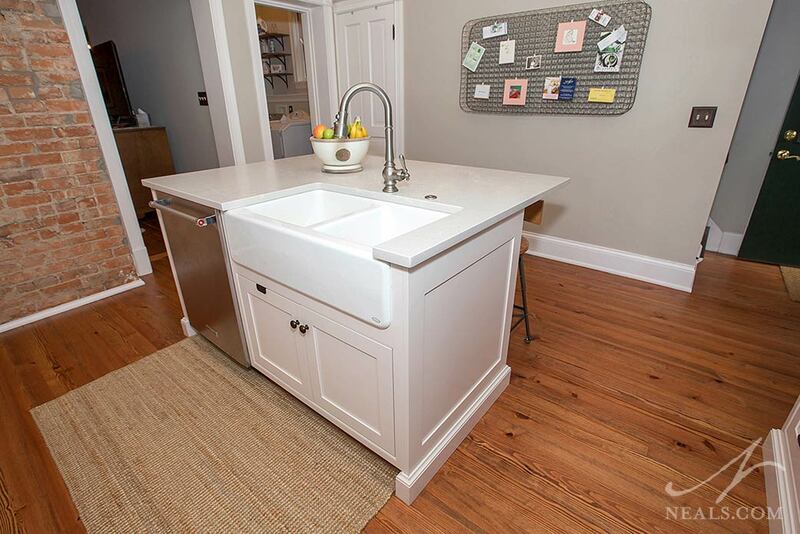 A farmhouse sink and dishwasher make it a functional hub. To fit both of these items, the sink was placed off-center, but the result is that the sink has a better equal distance to the cooktop, the fridge and ovens, creating a functional working triangle. On the other side of the island, space for three vintage schoolhouse stools acquired by the homeowner make this an eat-in kitchen. 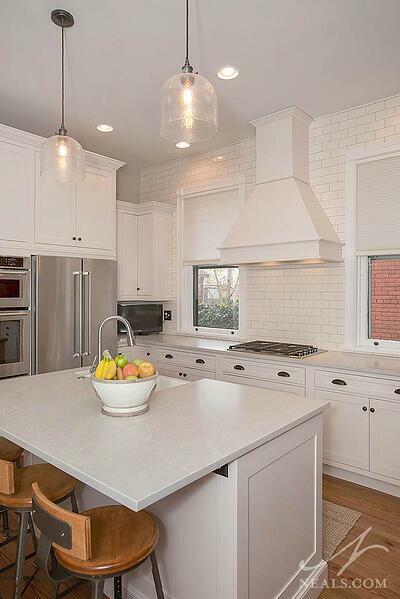 Chic Alpine Mist Caesarstone was used for the countertops for a durable surface that will stand the test of time. Storage and function prevail all around in the new space. 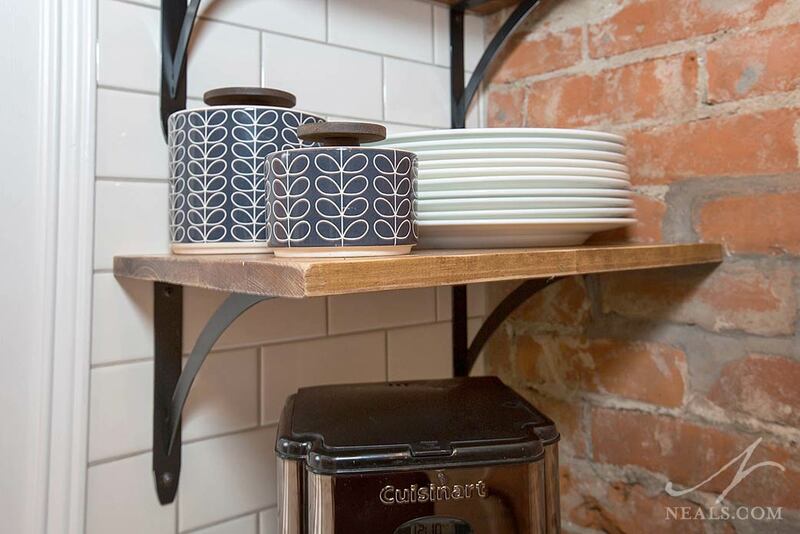 Interior cabinet fittings, such as a divided cupboard for baking sheets over the fridge, help keep the everyday items easily at hand and ready to be used. The kitchen is also well-lit with task lighting throughout and simple and stylish glass pendants over the island look like old-fashioned bell jars. 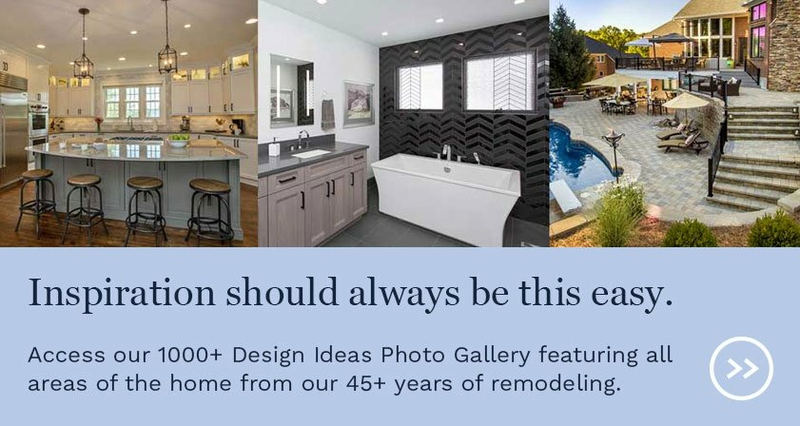 These additional details help ensure that the timelessness of the new design won't be easily or quickly outgrown in a home that's already been around long enough to see a thing or two.